Your holiday dish didn’t turn out the way you wanted, and you’re left with something that isn’t looking good or right. Welcome to my pumpkin ravioli nightmare. Pictures can be deceiving. 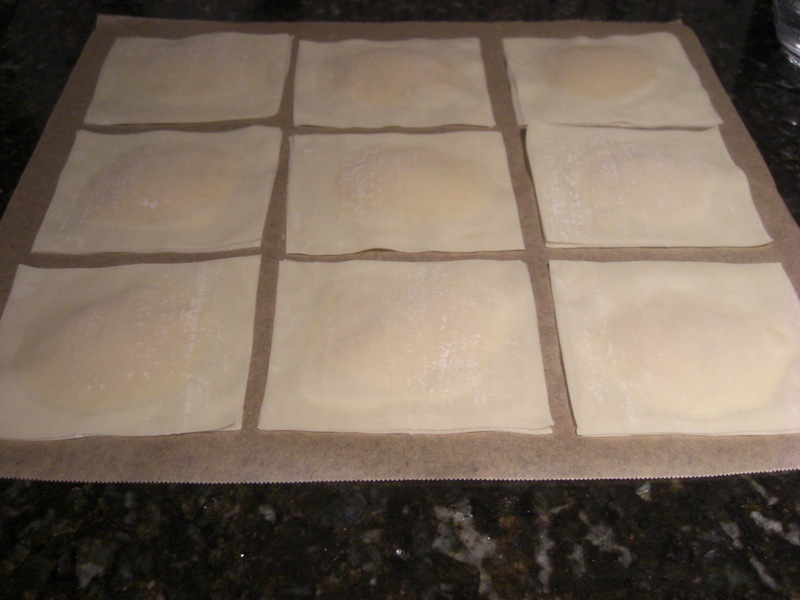 I set out to make a delightful dinner of pumpkin ravioli using wonton wrappers (you can buy these in almost any grocery). 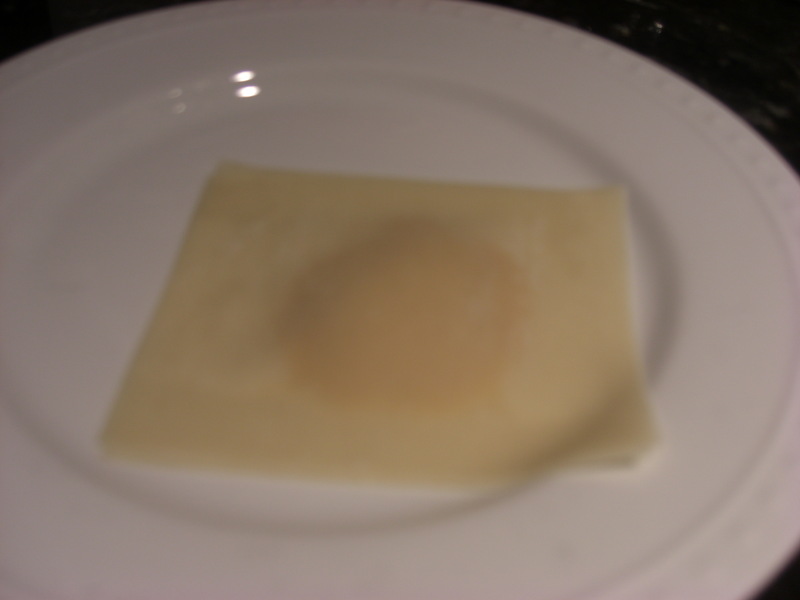 Apparently wonton wrappers do not like to be boiled, contrary to a popular tv star chef’s directions. I was a bit aggravated. When I realized this, looking over a pot of boiling water and pumpkin ravioli mush, I thought “why not try the directions on the wonton packaging- fry them?” So that is what I did with my remaining raviolis and my oh my, they turned out better than what I think the raviolis would have been (perhaps that is because food in fried form is just better). 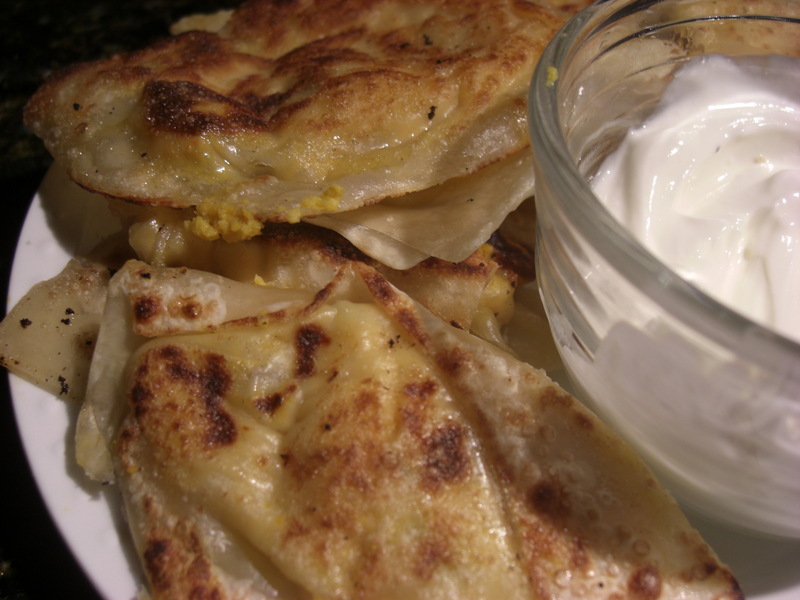 Crunchy but still doughy with a creamy dollop of pumpkin mash in the middle, the pumpkin potstickers paired well with a sour cream sauce. 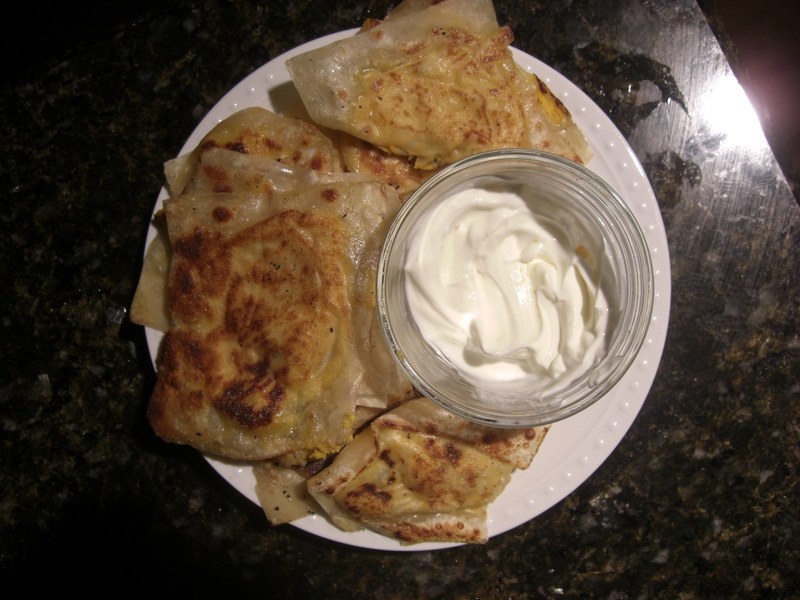 While these were not supposed to be potstickers, I learned an important lesson: work with what you have. I’m happy to say I salvaged my poor raviolis, and I believe now that dishes can have a second, if unexpected, incarnation. Don’t just throw in the towel. Work with your food, and hopefully it will work with you. Heat a small fry pan and add 1 tablespoon oil. Add shallots and garlic. Saute until soft and tender, remove from heat and set aside. Pour pumpkin puree into medium saucepot. Add cream, herbs and shallot-garlic mixture and cook over low heat for approximately 1 hour. Be sure to stir occasionally to prevent scorching. The puree should be thick and the liquid has evaporated. Remove from the heat and mix in the butter. Whisk in the beaten eggs and season with salt and pepper. Set aside to cool for about 10 to 15 minutes. Open wonton package so wontons are easily accessible. Pour a couple tablespoons of water into a ramekin. 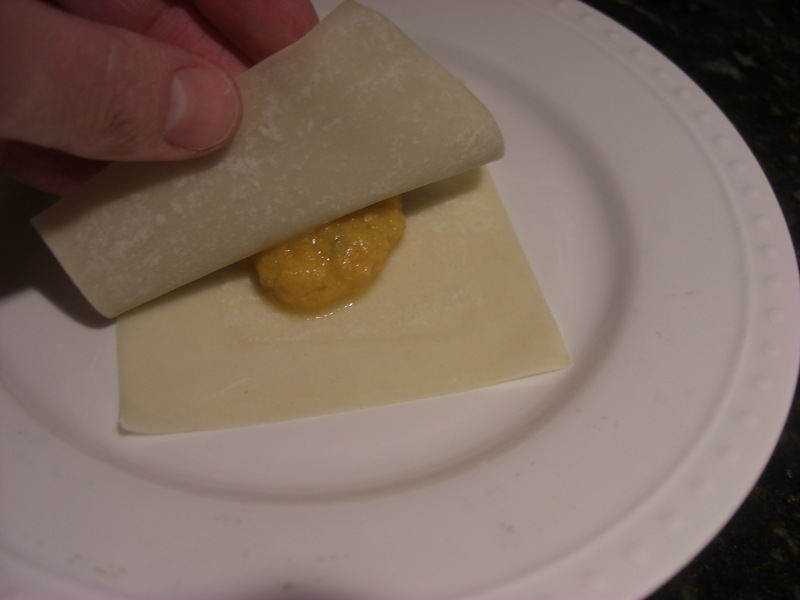 Take first wonton, dip finger in water and go along the edges of the wonton. 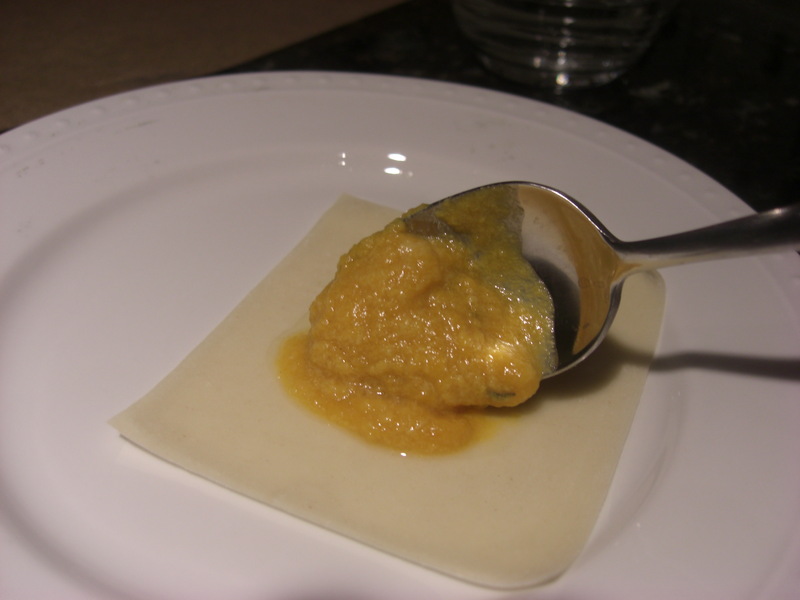 Put a dollop – about 1 1/2 teaspoons of the pumpkin mixture in the center, and cover with another wonton. Press down with fingers to seal. The water acts like a glue. Set aside and complete with remaining pumpkin mixture and wonton wrappers. When setting aside do not let the potstickers touch as they may stick. Note: Use immediately. I put a batch in a ziploc and they got very gooey and hard to handle. You may be able to store in a sealed tupperware in the freezer, taking care potstickers do not touch, but I have not tried it. Heat a medium or large saute pan with oil to coat the bottom. 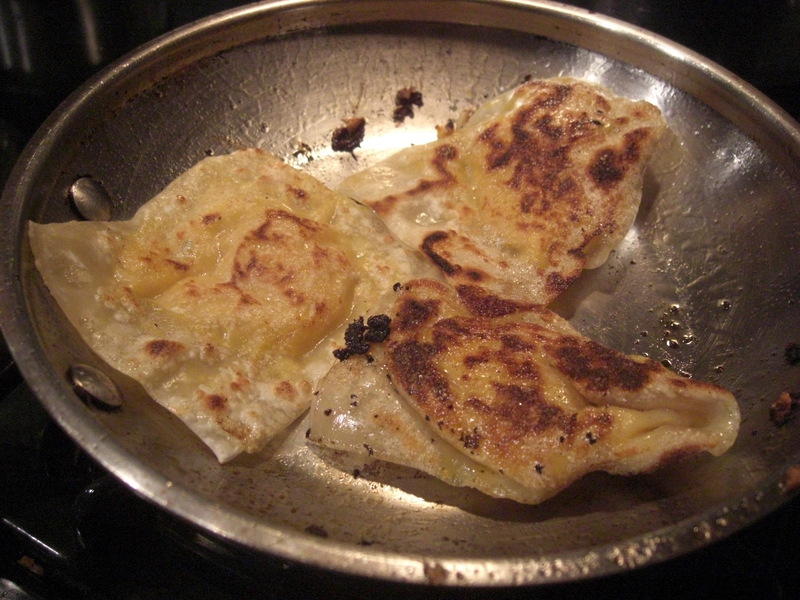 Add potstickers, being sure they do not touch and let cook about 3-4 minutes or until bottom side is golden brown. Flip and repeat, another 4-5 minutes or until golden brown. Set aside on a paper towel-lined plate. Continue in batches until you’ve used all the potstickers. Serve warm with sour cream dip and sage leaves to garnish.